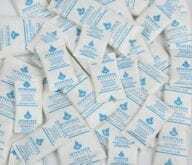 Silica gel is very effective in removing moisture from within a container. Our packets can absorb water and other substances like aromatics, CO2, C12, and HC1. By absorbing water, silica gel packets can stop mold from growing, and prevent spoilage and other forms of moisture damage. Our silica gel packets controls moisture introducing other substances or introducing toxins into its environment. It has no smell or taste and is chemically inert, meaning that other chemicals do not react to its presence. It also stays the same size and shape, even after absorbing water. Blue Indicating Silica Gel Packets, which change color to indicate their expiration so that they can be reactivated and used again, are also available. 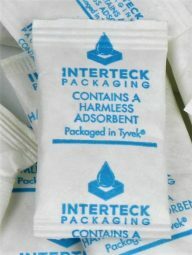 However, please note that because of this color-changing moisture indicator, this type of silica gel packet should never be used around pharmaceuticals, food products, or any other item intended for consumption.